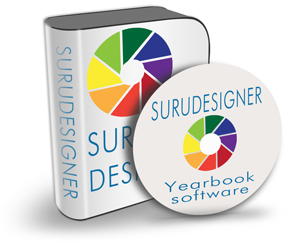 SuruDesigner® is our proprietary Yearbook Software, and we offer it to Yearbook designers for Free. This powerful Mac/PC software speeds the process of laying out complete yearbooks from cover to cover, and you don’t pay extra. Other software like Adobe InDesign and Microsoft Publisher are certainly not free, but are suitable for laying out your Yearbook. For a user without experience, however, these programs may be difficult to learn and use, because they have numerous distracting features that are extraneous to Yearbook design. By contrast, SuruDesigner is made for designing Yearbooks. So it is intuitive and easy to learn, and a first time user can design a Yearbook in no time at all! Step 1: Download and install SuruDesigner on your Mac or Windows computer. Step 2: Download the SuruDesigner Tutorial PDF file. Open the Tutorial file and follow the instructions. SuruDesigner already contains a variety of background images and decorative artifacts for your Yearbook. But if you prefer to design your Yearbook with Adobe InDesign, Microsoft Publisher, or Quark Express, that’s fine too. These programs allow you to convert your document to a PDF file, which is all we need to publish your Yearbook.